Windows 7 introduces the new Ambient Slideshow that launches as a screensaver when you initiate Play Favorites from the Pictures + Videos menu. All pictures you personally rate 3 stars or higher are pulled into the Ambient Slideshow with zoom in, zoom out, and zooming animation features. It can also play slideshows within a slideshow selection. The animation starts off as a gallery wall of your pictures (see Figure 2). The new ratings system places your rated pictures into various buckets that WMC uses to draw its slideshow images from to produce the gallery wall and other effects. Figure 2. View your image collection as a slideshow in WMC. The Shared category of the Pictures Library inherits the Shared library, which includes images from other computers on the network. You can also create custom slideshows using the Create Slide Show action under the Slide Shows category heading, as shown in Figure 3. If you hold down left or right directional arrows on your remote, Turbo Scroll will fast-forward images through the slideshow. Figure 3. Create custom slideshows from your picture collections. Arrange Windows Explorer so that you can right-click and drag your photo folder into Pictures. Left-click the relocated photo folder and select Create Shortcut Here from the context menu that appears. When you go to Pictures in WMC, you’ll now see a folder there with the name of your photo folder. Open that folder to see the pictures. When you play your slideshow, it begins at the level of the open folder. If you have your photos arranged in folders, like I do, first drill down into the folder to be included in the slideshow. Photos in the folders below the current level will not be displayed. You can use the remote control or keyboard to step through the slides. 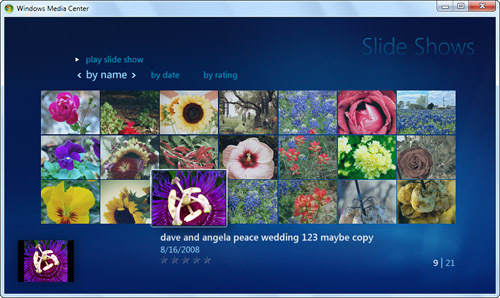 When prompted by AutoPlay, select View Pictures Using Windows Media Center. The Play Slide Show menu appears with the memory card selected. The name varies depending on the type of media inserted. For example, if your pictures are on a memory stick, the media is called MEMORYSTICK. If you are using an SD memory card, the media is called Microsoft WPD FileSystem driver. You can add music to your slideshow (and even a playlist consisting of a number of files). This is a nice feature to spice up your slideshows. This way, even if you are boring your audience with endless pictures of your baby, at least they’ll have some music to listen to. From the WMC Start screen, go to Music and start your music playing first. You can print a picture when stepping through images from WMC. When the picture you want to print is onscreen, press the More Info/Details button on the remote control. Then, choose Picture Details. Next, choose Print from the menu and Print once more when prompted to confirm your selection to print the image. Return to the WMC Start screen and go to Pictures. Click Tasks, Settings, Pictures to choose whether the song information shows onscreen while songs are being played. 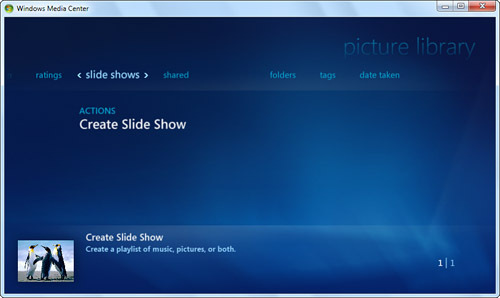 Start your slideshow by selecting Slide Show. This feature works in conjunction with Windows Media Player. WMC puts its interface (skin) on top of WMP. You can play audio CDs, copy CD tracks to your Music library, or play your library. When playing CDs or files from the library, song and album information (if available) is displayed onscreen. If you use another program—such as iTunes, MusicMatch, or WinAMP—to organize and play your MP3, WMA, or AAC files, you’re out of luck unless you also import your files into WMP. But be careful that you don’t rearrange your files in WMP and then mess up your song organization in your other player. Run WMC or press Start on the WMC remote. Insert the CD. It should start to play. If you want to copy the CD files into your Music library, select Copy CD. When your MP3 files are all organized using WMP, run Music. You can play back tunes and view visualizations on your TV or computer monitor. You have to use WMP to create playlists, manage your files, and modify ID3 tags (things like genre, artists’ names, and so forth), however. Click the Visualize button to switch the screen to a series of sometimes-lovely and mesmerizing motion graphics. WMC uses the same visualizations as WMP. You can find and install new ones by searching the Web for “visualization” and downloading ones designed for WMP. - Windows 7 : The WMC Hardware (part 2) - Can I Upgrade My Non-WMC PC to a WMC PC? - Windows 7 : Windows Media Center—What’s the Hubbub?